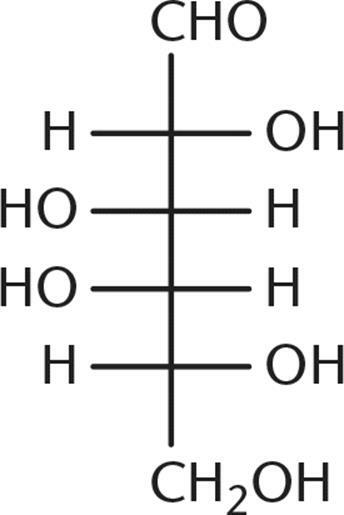 3. has five chiral carbons. 4. is one of a group of 16 stereoisomers. 1. they differ in configuration about only one carbon. 2. they usually have slightly different chemical and physical properties. 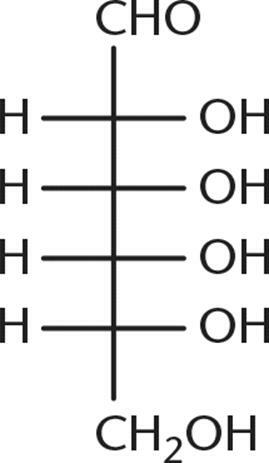 3. they are diastereomers (with the exception of glyceraldehyde). 4. they always have equal but opposite optical activities. 1. can be oxidized, and therefore act as reducing agents. 2. can be reduced, and therefore act as reducing agents. 3. have been oxidized, and have acted as reducing agents. 4. have been oxidized, and have acted as oxidizing agents. 5. Ketose sugars may have the ability to act as reducing sugars. Which process explains this? 1. Ketose sugars undergo tautomerization. 2. The ketone group is oxidized directly. 3. Ketose sugars undergo anomerization. 4. The ketone group is reduced directly. 6. What is the product of the following reaction? 7. Which of the following enzymes cleaves polysaccharide chains and yields maltose exclusively? 9. Why is the α-anomer of D-glucose less likely to form than the β-anomer? 1. The β-anomer is preferred for metabolism. 2. The β-anomer undergoes less electron repulsion. 3. 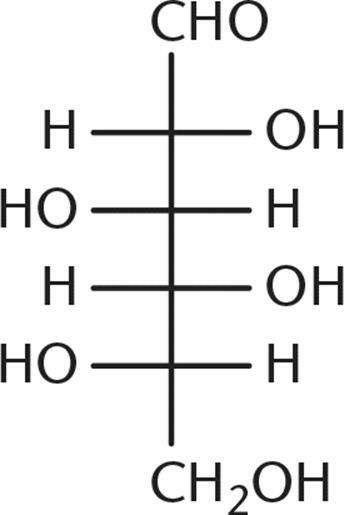 The α-anomer is the more stable anomer. 4. The α-anomer forms more in L-glucose. 10.Which two polysaccharides share all of their glycosidic linkage types in common? 11.Which of the following is digestible by humans and is made up of only one type of monosaccharide? 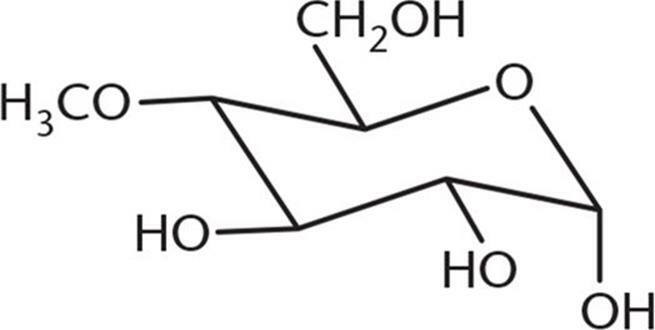 13.Galactose is the C-4 epimer of glucose, the structure of which is shown below. 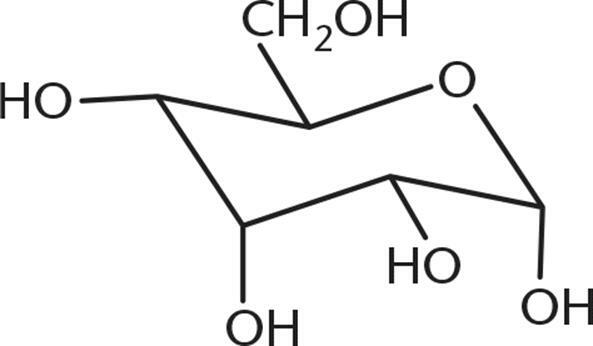 Which of the following structures is galactose? 1. decreased glycogen solubility in human cells. 2. slower action of glycogen phosphorylase. 3. less storage of glucose in the body. 4. glycogen devoid of α-1,4 linkages. 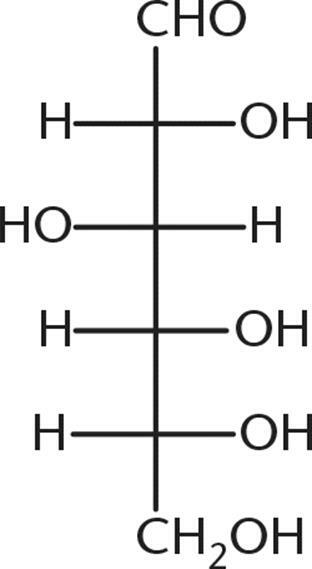 Glucose is an aldohexose, meaning that it has one aldehyde group and six carbons. Given this information, choices (A) and (B) can be eliminated. In aldose sugars, each nonterminal carbon is chiral. Therefore, glucose has four chiral centers, not five, as mentioned in choice (C). The number of stereoisomers possible for a chiral molecule is 2n, where n is the number of chiral carbons. Because glucose has four chiral centers, there are 24 = 16 possible stereoisomers. Epimers are monosaccharide diastereomers that differ in their configuration about only one carbon. As with all diastereomers, epimers have different chemical and physical properties, and their optical activities have no relation to each other. Enantiomers have equal but opposite optical activities. Therefore, choice (D) is the only statement that does not apply to epimers. Aldonic acids form after the aldehyde group on a reducing sugar reduces another compound, becoming oxidized in the process. Mutarotation is the interconversion between anomers of a compound. Enantiomerization and racemization, choices (C) and (D), mean the same thing as each other: the formation of a mirror-image or optically inverted form of a compound. Glycosidation, choice (A), is the addition of a sugar to another compound. Ketose sugars undergo tautomerization, a rearrangement of bonds, to undergo keto-enol shifts. This forms an aldose, which then allows them to act as reducing sugars. A ketone group alone cannot be oxidized. Anomerization, mentioned in choice (C), refers to ring closure of a monosaccharide, creating an anomeric carbon. When glucose reacts with ethanol under acid catalysis, the hemiacetal is converted to an acetal via replacement of the anomeric hydroxyl group with an alkoxy group. The result is a type of acetal known as a glycoside. This corresponds with choice (B). Choice (A) is incorrect because the –OH on the C-6 carbon would not be converted to –OCH3. 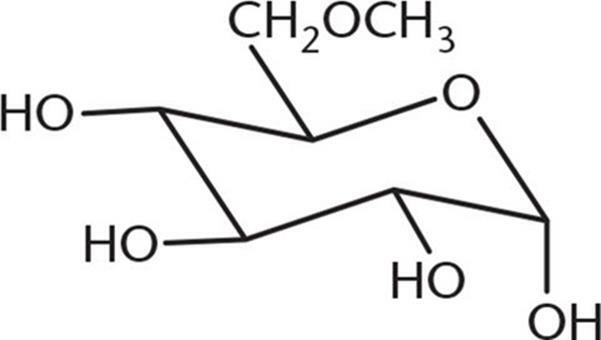 β-Amylase cleaves amylose at the nonreducing end of the polymer to yield maltose exclusively, while α-amylase, choice (A), cleaves amylose anywhere along the chain to yield short polysaccharides, maltose, and glucose. Debranching enzyme, choice (C), removes oligosaccharides from a branch in glycogen or starches, while glycogen phosphorylase, choice (D), yields glucose 1-phosphate. Start by drawing out the Haworth projection. Recall that all the groups on the right in the Fischer projection will go on the bottom of the Haworth projection, and all the groups on the left will go on the top. Next, draw the chair structure, with the oxygen in the back right corner. Label the carbons in the ring 1 through 5, starting from the oxygen and moving clockwise around the ring. Now, draw in the lines for all the axial substituents, alternating above and below the ring. Remember to start on the anomeric C-1 carbon, where the axial substituent points down. Now start filling in the substituents. The substituent can be in either position on the anomeric carbon, so skip that one for now. The –OH groups on C-2 and C-4 should point downwards while the –OH group on C-3 should point upwards; choice (C), the β-anomer of D-glucose, is the only one that matches. The hydroxyl group on the anomeric carbon of the β-anomer is equatorial, thereby creating less steric hindrance than the α-anomer, which has the hydroxyl group of the anomeric carbon in axial position. Glycogen and amylopectin are the only polysaccharide forms that demonstrate branching structure, making them most similar in terms of linkage. Both glycogen and amylopectin use α-1,4 and α-1,6 linkages. Cellulose uses β-1,4 linkages and amylose does not contain α-1,6 linkages. 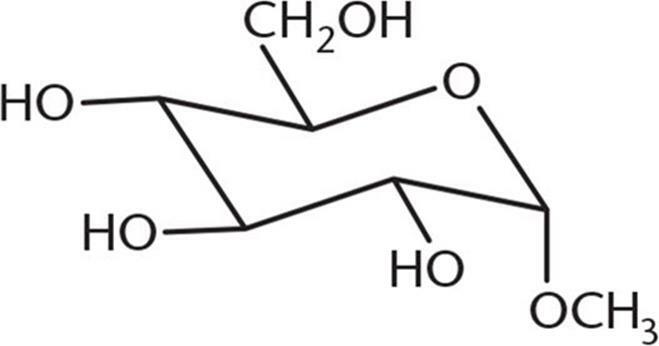 While maltose and cellobiose both have the same glucose subunits, only maltose is digestible by humans because β-glycosidic linkages cannot be cleaved in the human body. In solution, the hemiacetal ring of glucose will break open spontaneously and then re-form. When the ring is broken, bond rotation occurs between C-1 and C-2 to produce either the α- or the β-anomer. The reaction given in this question depicts the mutarotation of glucose. Choice (A) is incorrect because the reactant is an aldehyde, not the product. Choice (B) is incorrect because a hemiketal has an –OH group, an –OR group, and two –R groups. 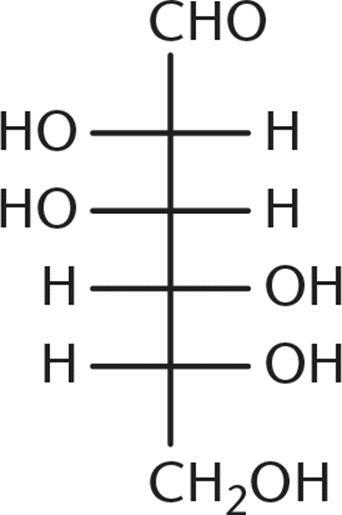 In addition, hemiketals are formed from ketones, and our starting reactant is an aldehyde. Finally, choice (D) is incorrect because there is no glycosidic bond in the starting reactant. 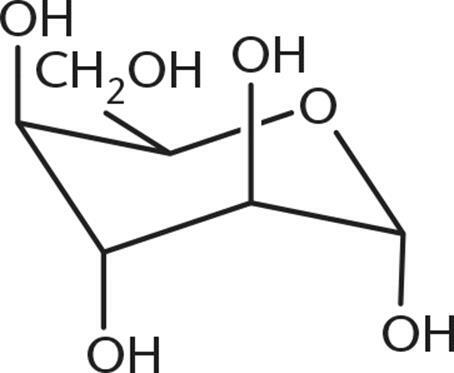 Galactose is a diastereomer of glucose, with the stereochemistry at C-4 (counting from the aldehyde) reversed. Being able to identify C-4 is enough to answer this question, even without looking at the glucose molecule. Because choices (B), (C), and (D) have identical stereochemistry at C-4, they are incorrect. In Andersen's disease, glycogen is less branched than normal, thereby inducing lower solubility of glycogen. Branches reduce the interactions between adjacent chains of glycogen and encourage interactions with the aqueous environment. The smaller number of branches means that glycogen phosphorylase has fewer terminal glucose monomers on which to act, making enzyme activity slower than normal overall. Finally, without branches, the density of glucose monomers cannot be as high; therefore, the total glucose stored is lower than normal. Glycogen synthase is still functioning normally, so we would expect normal α-1,4 linkages in the glycogen of an individual with Andersen's disease but few (if any) α-1,6 linkages. Monosaccharides can exist as hemiacetals or hemiketals, depending on whether they are aldoses or ketoses. When a monosaccharide is in its cyclic form, the anomeric carbon is attached to the oxygen in the ring and a hydroxyl group. Hence, it is only a hemiacetal or hemiketal because an acetal or ketal would require the –OH group to be converted to another –OR group.